Dear Bureaucrats, Ur Doing It Rong! 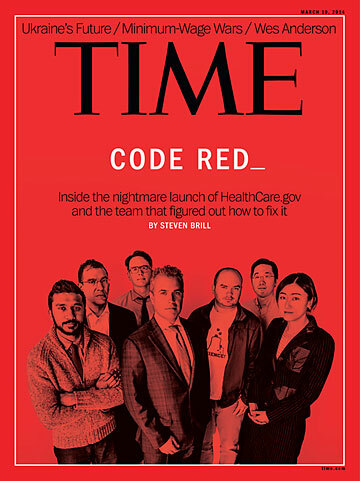 Time’s March 10th lead story, CODE RED_, about the high tech wizards who saved the healthcare.gov website, was not about a “team” in the normal sense of the word. It was about a miracle. A miracle of cooperation and focus. It told how the best and the brightest independent minds from around the country, “legends in elite technology circles,” came together to fix problems and not blame. How anti-bureaucratic. Author Steven Brill called them Obama’s Trauma Team–high-tech wizards who revived the HealthCare.gov website in astonishingly little time. They employed ingenious insights and technical breakthroughs (such as building a dashboard from scratch the moment they hit the ground to measure site traffic, in real time, and pinpoint crunch times and bottlenecks) is nothing less than awesome. The sacrifices they all made, leaving their companies, dropping everything to fix the site, wives flying out to resupply husbands… this is the stuff of legend. And the way they were able to interface with the original coders, without arrogance or ego, without assigning blame, was stunning. And it shrank recovery time dramatically. Within 6 weeks, the site was working at its advertised speed and improving daily. In this day in age, that defines the word miracle. The story itself is inspiring, exciting and insightful. As past chairs of the Old Pasadena Management District, OPMD, Suzanne Marks and I know this all too well. Of course, anyone who has ever worked with the government, knows this “all too well.” From the military to city councils, paperwork rules. They demand compliance, not performance. In one meeting it was explained in no uncertain terms, “We don’t need participants. We need pledge forms or we lose our funding.” Success was not an issue. It is the exact opposite of business. In business, success is measured in real dollars in a real cash register. It’s unequivocal. It’s immediate. What is crystal clear to businesspeople is a mystery to government drones. In one classic example, OPMD took over three aging parking structures that had been run by the City. The year OPMD took over garage management, the net annual average income was $5,001, but in our first year in charge, it skyrocketed to $500,000. Yes, OPMD did a hundred times better.